3.31 One day down… and a lifetime to go! 1.22 When things work out as they should. 2.10 Fancy the trip of a lifetime? 10.29 Done, dusted and back to normal! 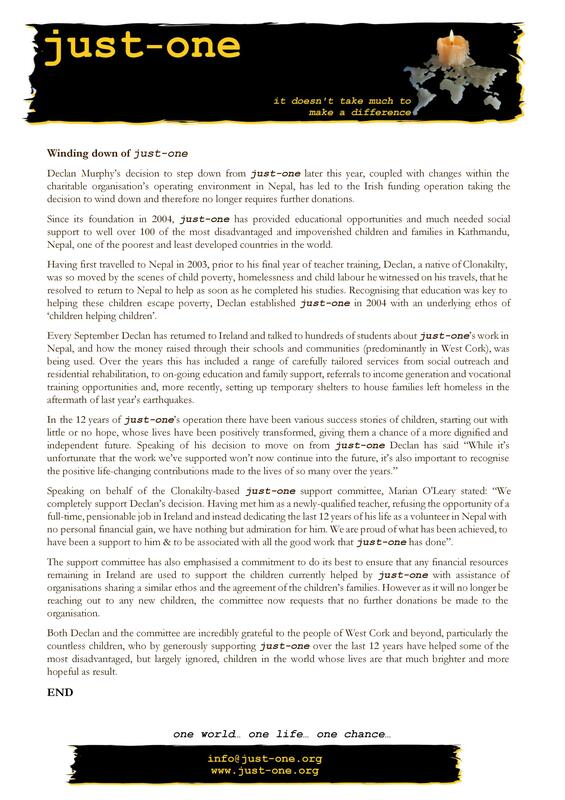 just-one strives to actively promote and facilitate educational opportunities for disadvantaged and marginalized children in Nepal by working at a grass-roots level with the children, their families and their communities to implement a range of carefully developed, culturally sensitive, sustainable initiatives. Having initially established just-one and helped guide its important work over the last 12 years, it’s with great disappointment that I now share news of an unfortunate series of events in Nepal which has brought an unexpected and untimely end to our work there. The situation, broadly summarised below, arose when, in response to news of my planned departure from the organisation later this year, the just-one board in Nepal was subjected to an unwarranted take-over. A meeting held without quorum in Kathmandu on April 2nd, saw 8 non-members (unknown to all but 1 board member) illegitimately appointed to the board as executive officers. informed beneficiary families that support was to be withdrawn and the organisation closed. Most telling perhaps is that, having arbitrarily sacked the team of social workers so crucial for the success of the follow-up care provided to our beneficiaries, an IT Officer has since been employed to create a new online presence (website, facebook page, etc) – soon to be soliciting donations and volunteer support, with the unauthorised use of the text and photos from this very website!! It’s important to emphasise here that this now questionable operation has neither the approval nor support of any of the numerous individuals who’ve helped shape just-one into what it had become over the years. We can in no way endorse any work this group may or may not engage in and, in line with our recent press release, must again reiterate that WE ARE NO LONGER SEEKING OR ACCEPTING ANY MORE FUNDS as the organisation is now to be closed in due course. Given the ever-present goodwill and willingness to contribute to the clear need that continues to exist in Nepal, I imagine many of our valued supporters may have difficulty in comprehending how something like this could actually happen. Perhaps those more familiar though with the NGO sector in what remains one of the most corrupt countries in the world will better understand that, sadly, such occurrences aren’t all that uncommon. As satisfying as it most certainly would have been to witness our good work to date continue, with the Nepali operation now so fundamentally compromised, I’m afraid that is simply no longer possible and hence a difficult decision was made to break ties and wind down. It was with this regrettable eventuality in mind that, prior to their dismissal, the long-serving and committed staff did their utmost to ensure the balance of funds with the organisation in Nepal were spent on ensuring as best they could that each of the 70+ beneficiary children received, in advance, everything they might need for a trouble-free and successful year at school. The just-one board in Ireland have also expressed their firm commitment to ensuring what limited funds remain will be applied solely to the purpose for which they were kindly donated – helping disadvantaged children access educational opportunities they would otherwise be denied. While it’s certainly not as straightforward or effective as it once was, with the assistance of some dependable individuals and trustworthy organisations in Nepal with whom I was able to put my colleagues on the Irish board in touch with, they have already successfully managed to provide the additional support needed by some of the beneficiaries who had begun falling through cracks which, not surprisingly, have appeared since the withdrawal of support services. Efforts will continue as much as possible to help link these children and families to other NGOs for the various services they may well need into the future. One day down… and a lifetime to go! Though certainly falling slowly with each passing year, school dropout rates in Nepal remain unacceptably high and untold numbers of children who 1st enrolled in Grade 1 ‘way back in 2006 have not, sadly and for a whole myriad of reasons, made it all the way through to Grade 10 and so won’t have sat the first of this year’s School Leaving Certificate exams which started here earlier today. Unfortunately, the ‘Iron Gate’ – as the SLC exams are referred to here in Nepal – will most probably remain shut to them for the remainder of their lives. Thankfully though, of the 600,000+ students who have had the questionable pleasure of nervously starting their SLC exams earlier today, I’m very happy to say 5 of them come from the ranks of those supported by just-one. As nervous as I’m sure they may well have been, I feel pretty confident too that they’ll do just fine. End results aside, they’ve already done themselves proud in even managing to get this far and we wish them all the very best for the remainder of these exams and the lives they’ll go on to create for themselves after. I’d also like to share our most sincere gratitude with all those who’ve so kindly supported our work over the years. Without this support, we’d have been able to do very little indeed so please take a well deserved bow for enabling us to actually offer all those we work with the opportunity of an education in the first place. Nepal’s future may well be more uncertain than it has ever been but I remain convinced that, rightly or wrongly, education is a key which will allow those who posses it to open more doors than those who haven’t been so fortunate. When things work out as they should. Isn’t it odd how quite often in life the right thing to do is rarely the easiest? So many times in our almost 12 years of operation we’ve encountered situations where reuniting the children we support with their families is nothing short of a mammoth (and quite often unending) task. There have been frustrating times when members of our team have most probably found themselves wondering why we couldn’t just refer the child in question to one of the relatively few well-run children’s homes in operation here and simply relieve ourselves of the responsibility. It would certainly be the least difficult option for us to pursue but, with a growing body of research continuing to highlight the longer-term negative impact such institutional care options have on a child’s development, we’ve always remained committed to doing as much as necessary to facilitate a safe and successful family reintegration wherever possible. I’m delighted to report that our most recent such case took an important step closer to this successful completion earlier this week when, after months of searching enquiries and painstaking detective work more than 100 miles from Kathmandu, the brother and sister pictured below finally got to meet their maternal grandfather. While there is certainly a whole lot of work still to be done to ensure that these beautiful siblings will return to the safe and loving family environment they both deserve and long to be in, the smiles, laughter and sheer excitement experienced here on Tuesday last when Grandpa came to visit were more than enough to convince us that we’re almost definitely still on the right track. It was yet another one of those beautiful moments when all past difficulties and frustrations experienced in actually getting to this point, quite simply pale into insignificance upon witnessing something as it should be – a family reunited. Congratulations! You've successfully reached the bottom of the page. go to the previous page, find out how to make a difference, or learn about our work.